Forget everything you ever learned about flooring, because luxury vinyl planks are going to change the way you live. Long gone are the days when you couldn't combine pets, children and exquisite flooring style. 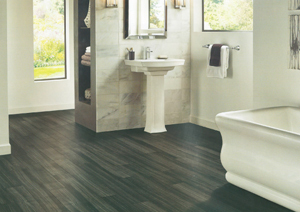 With Armstrong Luxury Vinyl Planking, you get flooring that is waterproof, durable and beautiful. You can get the look of wood without the upkeep or cost; this stunner is priced at $6 to $9 a square foot - and that is with installation! Today's energy-efficient windows pay for themselves in resource savings, keeping your home cooler in summer and warmer in winter. Plus, the best windows will also prevent sun damage to any furniture or flooring that's window adjacent. 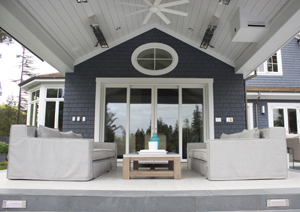 When you add in the improved style and functionality of new windows, they're a no brainer. Wondering how to sort through the multitude of technical and design options? Work with a pro. 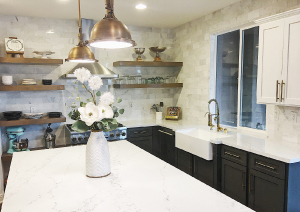 This stunning Valencia kitchen remodel was finished just last month and is so on point! It features a stunning quartz countertop, a farmhouse porcelain sink with a brass faucet and a brass pot filler over the high-end stove. A marble subway tile backsplash and floating shelves surround this absolutely gorgeous modern-elegant farmhouse kitchen. Tile gives you the opportunity to go bold with colors, patterns - or a combination of the two. There are so many beautiful designs that will coordinate fantastically with your existing or future kitchen and bath style. Many tile companies even give you the option to design your own tile so you can truly customize a design tailored to your precise taste. 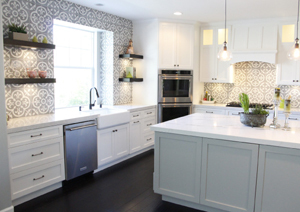 This kitchen showcases the Cannes tile from the Cement Tile Shop complementing the custom two-toned cabinets. Cabinets are another great way to add color! Pictured here is a painted white perimeter and a painted grey island. This March, the Samuel Dixon Family Health Center received a complete interior and exterior paint makeover as the recipients of ALLBRiGHT 1-800-PAINTING's 11th-annual Paint-It-Forward charity event. The Samuel Dixon Family Health Center (CDFHC) is a full-service non-profit that provides affordable, accessible primary care services to all residents of the Santa Clarita Valley and other underserved areas, with a special emphasis on serving the uninsured and underinsured. The health center was nominated for the Paint-It-Forward charity giveaway as the facility's interior and exterior paint was peeling, cracked and faded. After being alerted that they were in consideration for the giveaway, CDFHC's CEO Philip Solomon sent over pictures of the facility that highlighted the dilapidated condition of the building's paint. ALLBRiGHT's team of painters and volunteers beautified and restored the interior and exterior of the health center with a fresh coat of paint. All paint was donated by Benjamin Moore Paints. "I had the opportunity to witness over 40 volunteers and employees from ALLBRiGHT come together and perform their magic by truly transforming our center and giving it their ALLBRiGHT touch. Not only did they repaint the interior, but they repainted the exterior of both buildings, giving it a well-deserved make-over. All of us at Samuel Dixon Family Health Centers couldn't have been more pleased to see this transformation and we are excited to share it with our patients and our community," says Philip Solomon, CEO of CDFSC. The Paint-It-Forward movement was started by ALLBRiGHT 1-800-PAINTING's Chief Solutionist Josh Abramson in 2005. Since completing the first Paint-It-Forward 11 years ago, and now with other painting contractors joining the movement, their combined efforts have reached a goal of over $1,000,000 worth of free painting services and materials delivered to communities across the US and Canada. 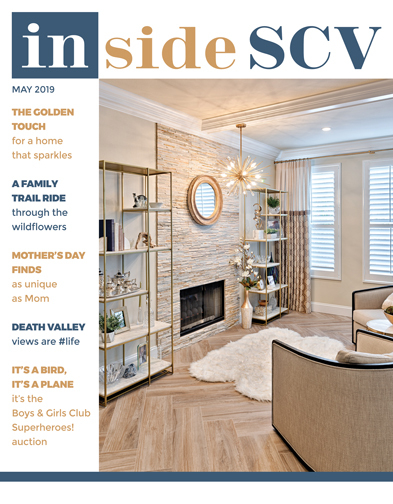 Past Paint-It-Forward recipients include The Children's Hunger Fund, SCV Food Pantry, Village Tree Preschool, Crossroads Community Church and more.